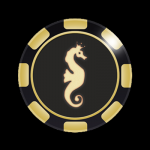 Jackpots in a Flash casino is an online casino that operates under the license issued by Malta Gaming Authority and is powered by Microgaming software. It is mobile compatible casino with 24/7 customer support which is specially there for the German players. 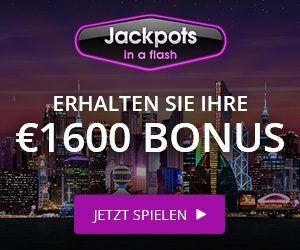 This might look familiar to you if you have played at online casinos before, Jackpots in a Flash is the sister site of Jackpot city casino, this casino website has been specially created to serve the players from Germany so that they can get the best support and services in their own language. You can play in your own currency and also receive bonus in your local currency i.e Euros. The welcome bonus at Jackpot city casino is $1600 and the welcome bonus at Jackpots in a Flash casino for the German players is €1600 which is definitely a little more than $1600. Promotional Welcome Bonus : Grab a whopping welcome bonus up to €1600 on your first 4 deposits. Live chat available, support can be reached through email as well. The welcome bonus offered at Jackpots in a Flash casino is among highest offered in the online gambling industry. The welcome bonus offered at Jackpots in a flash casino is €1600. Please note that this Jackpots in a flash welcome bonus is only available to new players only. 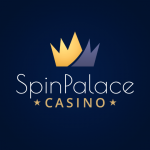 This welcome bonus is divided into 4 slabs, which means you will not get a welcome bonus of €1600 on your first deposit, this is the maximum bonus you can get on your initial 4 deposits. The match percentage is 100%. You don’t require any welcome bonus coupon code in order to redeem the welcome bonus, it is instantly credit to your account as soon as you make the minimum required deposit. The minimum required deposit is usually not high, most of the online casinos keep it at €20. Jackpots in a flash has a huge collection of casino games and slots. There are lots of Microgaming slots and those who are interested in Progessive jackpots can also enjoy some progressive slots like Mega Moolah slot, Major Millions slots. Apart from these slots, jackpotsinaflash casino also has a variety of table games with multiple variants of Blackjack like Atlantic City blackjack, Double Exposure blackjack, European blackjack, Multi Hand blackjack, Bonus blackjack and Classic blackjack etc. Love Roulette? Jackpots in a flash has a bunch of roulette variants like French roulette, European roulette, American roulette, as well as Premier roulette and progressive Roulette Royale. Want to enjoy the Live dealer games? No problem at all as Jackpots in a flash casino also features live casino where you can play with a live dealer. The best part about the gaming experience on Jackpots in a flash casino is that the games it has are mobile compatible. It is optimized for both Android and iOS devices which are the most used devices in today’s date. Customer support matters a lot and Jackpots in a Flash has taken care of it. There is always a point when you need someone to assist you with a problem and for that, the product need to have a strong customer support by its side that is available 24/7. Fortunately, JackpotsinaFlash casino provide satisfactory support to all its gamblers. Their support is available through live chat and email. Unfortunately, there is no phone support. The casino uses SSL encryption to protect your sensitive data. The job of SSL encryption is to keep your personal data that you entered on the website unreadable, it makes sure that no one can read your data. Jackpots in a Flash casino is an online casino that is specially targeted to players from Germany. They have thousands of online casino games and online slots with good customer support. Unfortunately, there is no phone support.